Product prices and availability are accurate as of 2019-04-23 03:27:51 PDT and are subject to change. Any price and availability information displayed on http://www.amazon.com/ at the time of purchase will apply to the purchase of this product. 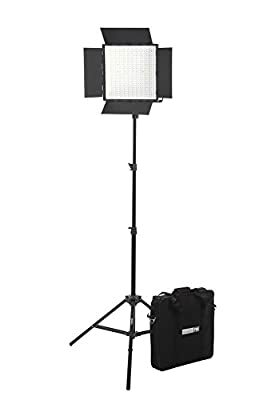 StudioPRO Premium Bi Color 600 LED Barndoor Video Film One Light Kit w LED Carrying Case is a fine product and would be a great addition to your photographic tools and accessories collection. Whether you are a professional or amateur photographer or someone just having fun with photography. PhotoStuffOnline is happy that you are shopping on our site. PhotoStuffOnline selects products including StudioPRO Premium Bi Color 600 LED Barndoor Video Film One Light Kit w LED Carrying Case based on StudioPRO's reputation for producing dependable products. Expert photographers as well as amateurs and beginners alike will be happy with StudioPRO Premium Bi Color 600 LED Barndoor Video Film One Light Kit w LED Carrying Case. 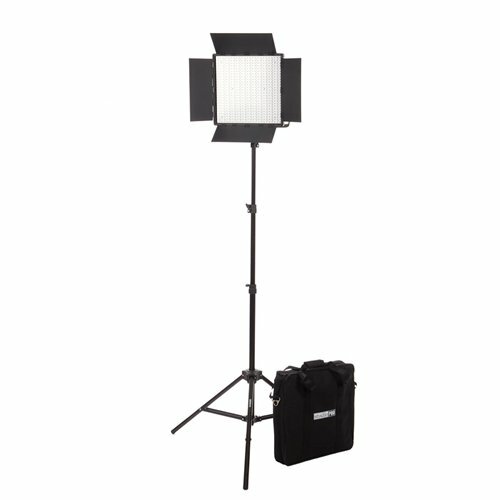 Take the next step in your journey and buy StudioPRO Premium Bi Color 600 LED Barndoor Video Film One Light Kit w LED Carrying Case now at this attractive price and save. Our prices are attractive and are among the lowest on the internet. The 600 LED light panel produces a longer illumination than normal compact fluorescent lights, because each LED bulb produces a 30-degree angle beam, directing the light further forward. Included are two filters; low density soft light filter, and high-density soft light filter. The low and high density filters act as soft light filters to soften the light output. Illumination: 6500 Lux at 1 meter distance, 1600 Lux at 2 meter distance, 750 Lux at 3 meter distance This LED Studio Light connects with 100V-240V A/C power through an A/C power adapter. This head generates virtually no heat, which makes it great for long photography, or video shoots. It is compatible with a Sony V-Lock battery (sold separately) that would make it completely cordless and extremely easy to transport. 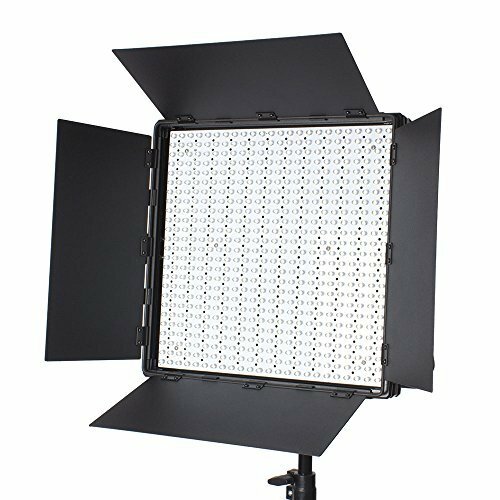 StudioPRO LED Barndoor Light Modifier is perfectly pared with your StudioPRO 600 Daylight or Bi Color LED light panel for video or photography. Easily snaps onto the front of the 600 LED panel for instant light shaping capabilities. Designed to restrict light from areas of your set to get the perfect direction of light. It has four adjustable leaves for LED light customization. The StudioPRO Premium Bi Color LED 600 Light Panel with Aluminum casing is a 3200K-5600 Kelvin full spectrum tungsten or daylight balanced LED panel light that is great for photography or video. It has 600 long-lasting individual LED bulbs. It emits 6500 lumens of light at one meter, which is dimmable with stepless dials located on the back of the light panel. Our StudioPRO Bi Color LEDs let the photographer or videographer control the light temperature in the light panel itself. Thus, making it easier to light scenes with lighting combinations, combine with other existing lights, or create a desired light temperature. Bi Color LEDs provide a greater versatility and convenience without the hassle of filters to change the temperature. Bi Color LEDs have two dials on the back of the panel to adjust the intensity of light emitted at either 3200K or 5600K. Our LEDs are split, half of the panel being 3200K LEDs and the other half being 5600K LEDs. Adjusting the dials will dim the respective LEDs to control the color of the light. Think of this method like mixing paint colors. Adding 3200K will warm, or add yellow, to your light output. Vice versa, adding 5600K will add blue to your light output. With both dials turned the result will be a combination of both. This lightweight unit is great for on location videography or photo shoots. The StudioPRO Premium Bi Color LED 600 Light Panel with Aluminum casing is a lightweight and powerful professional LED lighting source. The aluminum casing allows weightless, yet strong protection for your lights. It is mounted on a U-shaped bracket, which makes it easy to position within 360 degrees. It can be used on any of our StudioPRO light stands. The StudioPRO LED Carrying Case for Premium 600 LED Panels is designed with the traveling videographer in mind. Easily take one of your LED panels on location in this padded case. This bag is ideal as it is equipped with two carry handles as well as a removable padded shoulder strap. It is equipped with two small internal pockets for storage of small devices. This LED case protects your 600 Daylight or Bi Color LED, and is a great way keep them safe when not in use too.